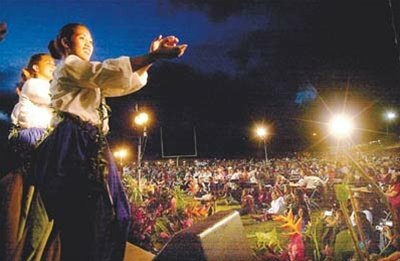 The mission of the Arts, History & Culture Committee is to preserve and perpetuate the study of the arts and Hawaiian culture in the unique cultural and historical setting of Lahainaluna. The Committee is currently renovating the Lahainaluna Cemetery. The site has fallen into disrepair over the years and has not been renovated since the 1920's. Please contact the Foundation if you would like to assist with this project. With the help of community and committee members, the dream of a new Kahua (Hula Platform) and restoration of the Boarder's Field stage has become a reality and was showcased during David Malo Day in 2008. Built in the early 50’s by Earle Kukahiko and boarding students, The Boarders’ Field stage was actually constructed for annual May Day Programs. When the back seating was added in 1957, graduations began to take place there. Now a cultural and historical treasure, it is now utilized annually for David Malo Day, Lahainaluna’s signature Hawaiian cultural program; and is the only stage in existence at Lahainaluna. A project is proceeding to add an earthen and rock stage in front of the existing one—Kahua—a hula platform. This added platform will be used for David Malo Day hula performances, and can also be used for many other outdoor performances. When a new cafeteria becomes a reality at the Olowalu end of Boarder’s Field, this will become a well utilized area for special school events.